Files are important and contain critaicl information, but the Windows OS default deletion makes recovery of files very easy as by default the files are sent to the recycle bin or if cleared from the recycle bin also makes recovery very easy using simple data recovery tools.I’ve earlier shared tools like Eraser and Darik’s Boot and Nuke for deleting files permanently, but these required installation and are not portable apps. 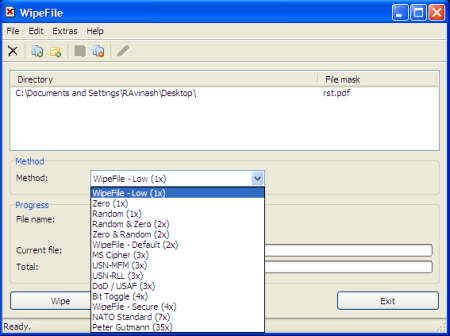 WipeFile is a portable file deletion tool that can delete individual files and folders permanently without the possibility of recovery using very strong file deletion algorithms.It supports 14 different methods that can be used to securely delete files.It also supports the “Peter Gutmann” method of deletion that overwrites data 35 times for secure deletion. 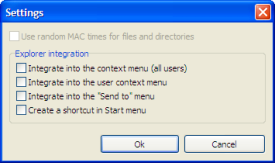 The application can also be added to the context menu, so that the file/folder can be deleted using WipeFile.The application can be added to the context menu, “ Send To ” menu aswell, the said options can be set from WipeFile Setting which is available under Extra’s Settings. Note – The “Peter Gutmann” method take more time complete as the number of overwrites are high, but this ensure the best possible results so that data become less susceptible to recovery using commonly used recovery techniques. The language of the WipeFile can be changed from “Extra” – > Language. WipeFile supports Windows OS only. Do use any other app for deleting your files, do share it with us.